In the afternoon, Mayor Ko Wen-je attended a joint press conference of businesses from the Dadaocheng area titled Fragrant Dadaocheng – Chinese Herbal Festival. 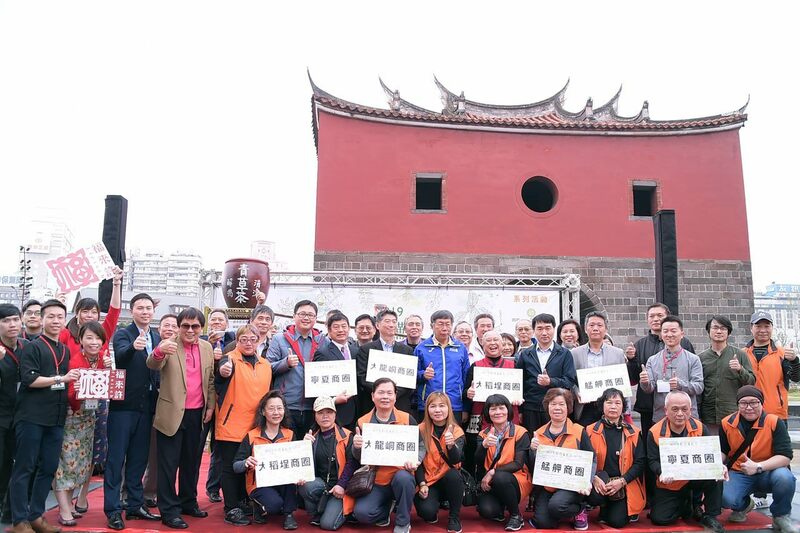 In his speech, he cited the distribution of foreign travelers in Taipei, who rank Taipei 101 as the number one sight to be seen, followed by the National Palace Museum, and in third place Dadaocheng, the thriving settlement from Taiwan’s 1920s which is especially popular with Japanese and Korean tourists. This is a good foundation to grow bigger visitor numbers in the future. Ko went on to say that the earliest fragrances in the Dadaocheng area used to be those of tea. Later, wafts of coffee were added to the scents lingering in its streets. Now, Chinese herbs are making their presence known through their distinct aromas and their very own festival. The event aims to attract visitors to the neighborhood through the fragrances of Chinese herbal soups, dishes with medicinal herbs, and wholesome herbal drinks. In the past, Dadaojing, Taipei City Wall, and Bangka were collectively called the “Three Market Streets” because they were laid out along a single north-south axis. These days, the same connection from Dadaocheng’s herbal heritage via Beimen to Bangka is reinforced to offer a comprehensive sightseeing experience. He added that all around the world, tourism is based on culture. For skyscrapers you visit New York. For East Asian architecture, especially Minnan-style architecture, Taipei is emerging as the destination of choice. The mayor concluded by saying that he felt happy that this event connected with the Ningxia Night Market, Dalongdong Shopping District, and the Bangka Night Market. This way, the “Three Market Streets” are connected again. Dadaocheng is by far the oldest, but if the others package their historical Taiwanese features in a modern way, just like the Chinese herbs sellers have now done, then they could attract young people, an indispensable target group, because sightseeing areas cannot just rely on senior travelers. Having seen at this event how traditional culture is freshly presented in modern ways makes Mayor Ko look forward to future developments.